The Conference of European Rabbis (CER) on Tuesday bestowed its Lord Jakobovits Prize upon Spain's monarch, who said in his acceptance speech that it was his country's "duty in the name of justice" to do everything that Jewish life returns to Spain. At a ceremony at the Royal Palace El Pardo near Madrid, the king said the prize was in fact a recognition for the people of Spain and the country's institutions. Spain was an "open and tolerant" country marked by its "respect for diversity". 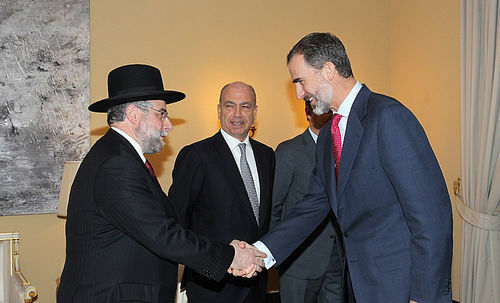 Felipe VI thanked Sephardic Jews for their continued love and loyalty to Spain. He also highlighted the fact that many towns and municipalities in Spain were now rediscovering their Jewish heritage. The CER's award to Felipe VI with its prize was also due to Spain's recent decision to grant citizenship to the descendants of Sephardic Jews expelled from Spain by the Catholic Inquisition after 1492. So far, around 4,500 applications have been approved. The CER's annual Lord Jakobovits Prize was previously given to former Polish Prime Minister and European Parliament President Jerzy Buzek, German Chancellor Angela Merkel, and former French Prime Minister Manuel Valls. I am truly moved by this great honour I receive today, after the Conference of European Rabbis has kindly awarded me with the 2016 Lord Jakobovits Prize of European Jewry. So, to all those who form part of this distinguished institution (in particular Rabbi Pinchas Goldschmidt), I sincerely say thank you from the bottom of my heart. However, it is but through me, as king and head of state, that you are really honoring Spain, its people and its institutions. I am, therefore, so very delighted that we are joined by representatives of Spain's civil society and of its Jewish community at this ceremony. The Conference of European Rabbis has carried out a truly commendable work throughout its history, and continues to do so. In particular, it has undertaken very important efforts and endeavors to rebuild Jewish communities in Europe following the Shoah, striving to prevent Jewish identity from disappearing as a result of the devastation. The Conference's current efforts should also be applauded, during these changing times in Europe, in which the continent is facing fresh challenges and uncertainties that −on occasion− test the very values on which our identity is based. And our European identity cannot be understood nor complete without taking into account the decisive contribution of the Jews, who have lived in the continent since the dawn of history. Now − as it did then − Europe needs the invaluable contribution of its Jewish communities, because we need to be honest and respectful to both our common Judeo-Christian values and origins, and the more broader or universal sense of true human values we are trying to extend and defend world-wide amidst the horrors and hatred that still persist in so many places on Earth… with so many falling victims from terrorism or fleeing from wars and persecution. Esteemed rabbis, I welcome you to Spain, an open and tolerant country in which respect for diversity is a defining characteristic. We are also filled with pride by Spain’s active and flourishing Jewish community, represented by the Federation of Jewish Communities of Spain and its president, Isaac Querub, who is here with us today. The Jewish community’s homecoming to Sepharad was serene and silent. Rites, liturgy, renowned surnames, ballads, proverbs and seasonings all returned −in short, so much that we should never have allowed to be lost. The key turning point was 1992, and the State Cooperation Agreement with the Jewish communities, which guaranteed individual and collective rights. In the same year, after entering the Ben Yaacob Synagogue in Madrid, the official welcome was marked by the words of my father King Juan Carlos: “Spanish Jews are in their homeland”, he said. Hoy quiero destacar el esfuerzo de muchos municipios españoles por recuperar su patrimonio y su legado judío. Por esta vía se ofrece a los millones de visitantes que cada año llegan a nuestro país el vivo recuerdo de lugares y personajes de alma judía que forman parte de nuestro legado histórico. Europe needs the invaluable contribution of its Jewish communities, because we need to be honest and respectful to both our common Judeo-Christian values and origins, and the more broader or universal sense of true human values we are trying to extend and defend world-wide amidst the horrors and hatred that still persist in so many places on earth. Un pequeño municipio se ha convertido en un símbolo de la lucha contra el antisemitismo. Se trata del pueblo burgalés de Castrillo, anteriormente llamado de Matajudíos y que desde mayo de 2014 luce con orgullo su nuevo nombre de Castrillo Mota de Judíos. Desde los poderes públicos se han lanzado iniciativas a la sociedad civil como es el caso del Centro Sefarad-Israel, que desde hace una década se afana en servir de puente entre España y el Mundo Judío en todas sus manifestaciones. De entre sus líneas de trabajo me gustaría destacar la denominada Plataforma Erensya que, leal al espíritu del Senador Ángel Pulido, se esfuerza en establecer puentes entre España y las comunidades sefardíes en la Diáspora. En abril de 2015 tuve ocasión de recibir a los representantes de esta Plataforma que representaban a comunidades sefardíes de todo el mundo: me emocioné con su lealtad hacia España, me conmoví con sus acentos…, y me alegró de verdad poder volver a expresarles que se encontraban en su casa. Especial mención merece también la promulgación de Ley 12/2015 de 24 de junio, en materia de concesión de la nacionalidad española a los sefardíes originarios de España. Se trata de un mensaje de cordialidad al Mundo Judío que contó además con el respaldo unánime de los grupos parlamentarios en ambas cámaras. Recuerdo con especial emoción el acto que hace poco más de un año celebramos en el Palacio Real alrededor de la esta Ley con la presencia de los judíos españoles y de otros muchos sefardíes llegados también de lugares lejanos. En mis palabras de hoy no puede faltar la mención a un hecho tan doloroso como el Holocausto. España se enorgullece de sus Justos entre las Naciones que ayudaron a salvar a miles de judíos en aquellos años oscuros. También comparte el horror de las víctimas con el sacrificio absurdo y cruel de sefardíes y deportados republicanos españoles. Nuestro país ha llevado a cabo notables esfuerzos legislativos para que la Memoria del Holocausto forme parte de las enseñanzas que se imparten en los colegios. España es miembro activo de la Alianza Internacional para la Memoria del Holocausto y desde 2006 se conmemora el acto de Estado de Memoria del Holocausto y la Prevención de los Crímenes contra la Humanidad. En enero de 2015, en el primer año de mi reinado, quise presidir dicho acto y pude ser testigo del dolor contenido en ese acto y de la enseñanza que en él se genera. En esa ceremonia tuve ocasión de saludar a una persona muy especial, a uno de los pocos superviviente de la Shoá que viven en España. Su nombre era Joseph Bohrer, era de origen húngaro y pudo rehacer su vida en nuestro país como un español más. Desgraciadamente, hace apenas diez días fallecía en Madrid dejándonos el legado de su ejemplo y su testimonio imperecedero. Deja también una familia entrañable a la que quiero transmitir mis condolencias en este día. Descanse en paz, zijronó livrajá. I would like to finish my remarks by returning to two matters which I have referred to on previous occasions, when addressing Sephardim; namely, justice and gratitude. All of Spain's efforts in recent years to return the country's Jewish culture to its rightful state are simply a duty in the name of justice. All of the Sephardim's unyielding love and loyalty towards Spain represents a powerful example for all peoples, and for generations to come. It certainly deserves our deepest, permanent and most sincere gratitude. Again, I thank the entire Conference of European Rabbis for awarding me this prestigious Lord Jakobovits Prize. I feel greatly honoured and moved, and would like to dedicate it especially to all the generations of Sephardim who, for five centuries, stayed true to their heritage and taught their children to love the memory of Sepharad. Blessed be their memory, yehí zurám baruj.